Thomasina's Purrls Of Wisdom About Cats: How Come The Cats Won't Drink From Their Bowl Instead Of My Glass? How Come The Cats Won't Drink From Their Bowl Instead Of My Glass? 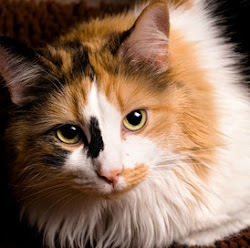 Thomasina, can you tell me why the cats won't drink from their bowl instead of my glass? They drink out of the glass I put beside my bed, when they have their own water right next to their food in the kitchen! Why do they insist on taking mine? Believe it or not, there are some good reasons why your cats won't drink from their bowl, and one is because your water tastes better. That's important to us because we don't guzzle water the way humans do. We take tiny laps and can taste every one. If there are crumbs of food in the water, it doesn't taste right, and we don't want to drink it. Cats like their water to be very far from their food. Another room is really best. Instinct and evolution have something to do with this. After all, we're descended from desert wild cats, and in the desert we wouldn't find a puddle of water right beside the lizard we were trying to catch. There's another reason why cats won't drink from their bowl, too, if it's right on top of their food. If there are bits of food in it, it doesn't taste right, and we don't want to drink it. 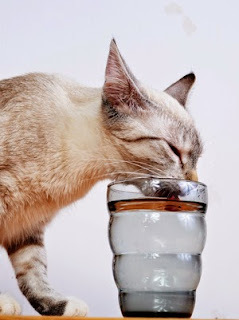 Cats don't have a strong thirst drive, so it's important to make your cats' water as appealing as possible. Try moving it far away from their food, and give them a bowl of water in your bedroom. If you do that, they'll drink their own water instead of yours. but this is our favorite.